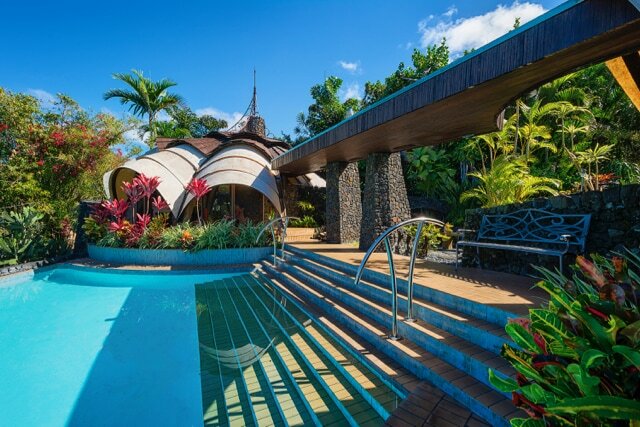 The Onion House, Hawaii... Vacation in a Work of Art - Vacation in a Work of Art! 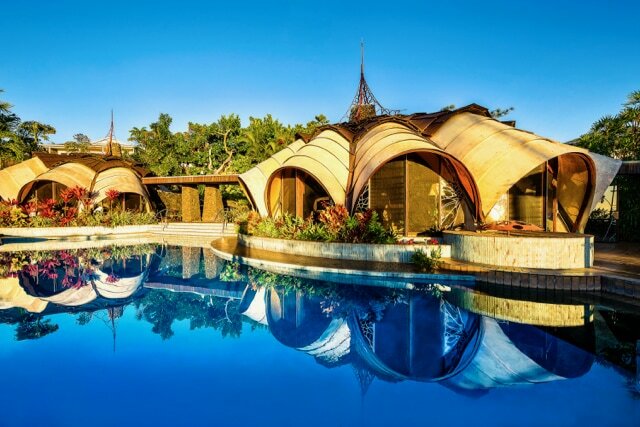 The Onion House, a landmark of Organic Architecture, was built for the McCormick Spice family. The Onion House remains undamaged by any of last summer's volcanic or hurricane activity - we appreciate the inquiries of so many concerned friends! 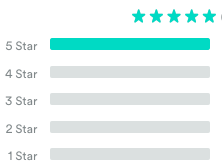 Recent VRBO Reviews show that things remain as unique and wonderful as ever. Hawaii Volcanoes National Park has reopened, and you can visit the Park's website for current statuses and changes to that area. "An architecture so full of life it seems to breathe!" A personal retreat in a work of art can have a profound transformational effect. 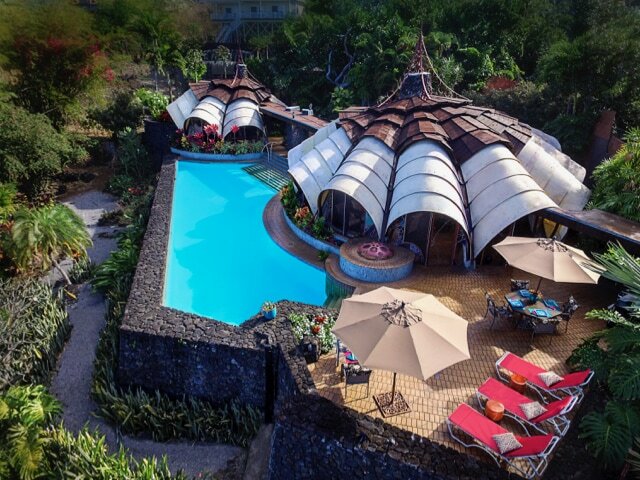 Created for the McCormick Spice family, the Onion House offers visitors a unique vacation experience set in an unforgettable slice of Hawaii's history. You will have the entire place to yourself, (The whole vegetable! 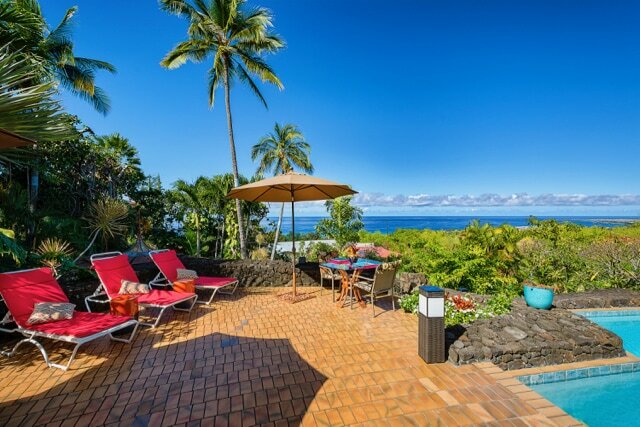 ), ideal for a personal retreat, creative rejuvenation, or as 'base camp' for exploring the Big Island. Lava Rock walls create a high terrace overlooking the sea, where two arching domes lie surrounded by pool, terrace and gardens. Light filters through colorful stained glass walls and translucent roof panels. With stunning visual aesthetics and luscious tropical surroundings, the compound affords ample privacy in which to swim, sunbathe, and enjoy the gardens, terrace, and 70 foot turquoise pool. A covered outdoor walkway connects the separate master bedroom, with private walled meditation garden, to the main structure, which holds two smaller bedrooms, bath, and fully equipped kitchen. 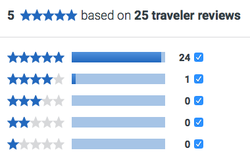 3 bed/ 2 bath; sleeps 6. (1 King; 1 Queen; 1 Double) With grounds of nearly an acre, the home is five minutes from town, restaurants, adventures and beaches, yet worlds away. 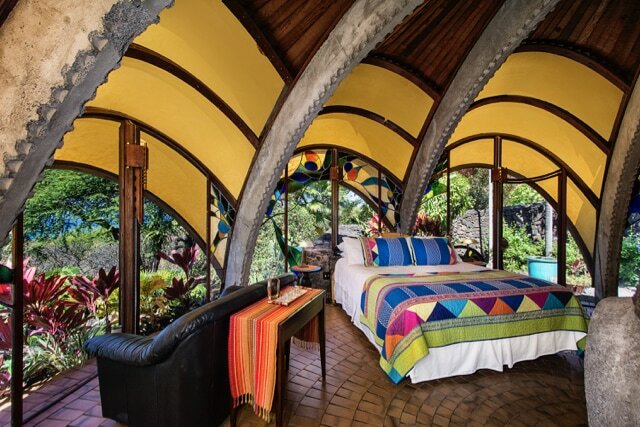 Hand-built in 1962 by renowned architect Kendrick Bangs Kellogg, an innovator of Organic Architecture, the home features stained glass by James Hubbell. The home has been lovingly restored by artist Beth McCormick (niece of the original owner) whose artwork germinated in this setting. In 2017, the home was purchased by new owners, , who continue to offer it as a unique destination. Guest's video of their week at the Onion House. Find the unique, the hand-crafted, the treasures that exist nowhere else on earth. These are my suggestions for planning your vacation, whether you're interested in the arts, in hiking, snorkeling, diving, the volcano, or the island food scene.